Once I start getting stuck in to my generous carafe of Cotes du Rhone of course, any menu-related confusion rapidly shrinks in importance, and once we’ve worked out the difference between the Confit de canard aux pommes de terre roties and the Confit de canard parmentier au foie gras (the chef is certainly doing his level best to decrease Thailand’s duck population), we settle on our order. Le Petit Zinc is a temple to all things classically French – framed prints of French icons such as Hector Guimard’s Paris Metro signs and the Renault 6, internet radio tuned into a French station and so on – and indeed the menu is so unashamedly Gallic I half expect it to start trying to seduce my wife before the starter has even arrived. And what else could that starter possibly be other than frogs’ legs, in this case sautéed with green pesto and served with smoked bacon? Truly a combination made in heaven, with the flavour of the bacon bringing out the delicate taste of the frog. Even Mrs FF, who once swore blind that she would never let so much as a gram of frog pass her delicate lips, tucks in with gusto and soon announces herself a convert to the amphibian delights of the grenouille. Thence to the mains. For me, pork loins with chorizo and olive, tomato & basil mash. Not, admittedly, a particularly French dish but I’m anyone’s for a bit of chorizo, and it certainly doesn’t disappoint – juicy, tender pork, topped with minced chorizo and accompanied by a mash which, in itself is average at best, but taken to new heights of originality by the addition of the olive, tomato & basil. A very tasty dish indeed, and one that I will be attempting at home. 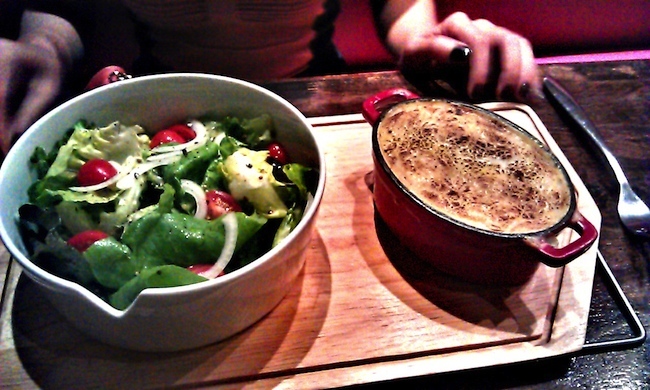 Mrs FF opts for the Confit de canard parmentier au foie gras, or duck & foie gras shepherd’s (duckherd’s?) pie in plain English. And it turns out to be a little piece of heaven – lovely creamy mash (clearly not made by the same cook who prepared mine), on top of a mix of minced duck confit and foie gras alternating between the crunchy saltiness of the duck and the orgasmic richness of the liver. Utterly spectacular, luxurious comfort food and, as Mrs FF is a creature of small appetite, I get to eat half of it. Which means I’m struggling to consider the dessert menu, so we decide to share an apple crumble. Said crumble provides the only negative of the evening. It’s not bad in itself, and if you hadn’t been practically reared on apple crumble I dare say you’d enjoy it. But I’m a purist when it comes to childhood comfort foods, and as such cashew nuts and raisins have no place here. A bit more brown sugar in the crumble would’ve gone down nicely too. But given food of this quality, cooking in which you can really taste the love, it’s churlish to quibble over a nut here or a raisin there. Le Petit Zinc isn’t cheap by Bangkok standards – a starter, two mains, a dessert & a carafe of wine set us back over $85 – but for dishes clearly conceived & cooked with such imagination & passion, accompanied by absolutely flawless service (there when it’s needed, invisible when it’s not) it’s well worth the occasional splurge. Ditch the dual menu policy, and even Gordon would be happy.